Whisk together flour, baking powder, baking soda, salt, and cinnamon in a bowl. In a separate bowl, beat together softened butter and cream cheese until smooth and creamy. After they come together, whip at high speed for a couple minutes. Add sugars and beat until fluffy. Add the eggs and vanilla and mix until combined. Add 1/3 of the flour mixture to the wet ingredients, then with the mixer at medium-slow speed slowly stream in 1/3 of the buttermilk. Repeat two more times until all the flour and buttermilk has been incorporated into the batter. Toss the blueberries and flour in a bowl, then gently fold into the batter. Divide the batter evenly between the two pans. Bake for 30-35 minutes until a knife inserted in the center comes out clean. In a large bowl, combine the butter and cream cheese and beat on medium-high until light and fluffy. Gradually add the vanilla and powdered sugar until both are fully incorporated. Pour in the whipped cream, and beat on high for 2-3 minutes until super fluffy. Once the cakes are cooled, top one of the cakes with half the frosting, then top with the other cake and the rest of the frosting. Top with additional fresh blueberries. I agree very much with what you say about Gaiman’s writing style. And I think there’s nothing wrong to it if you’re emulating his writing style. In a perfect world, most (if not all) people would write like he does. 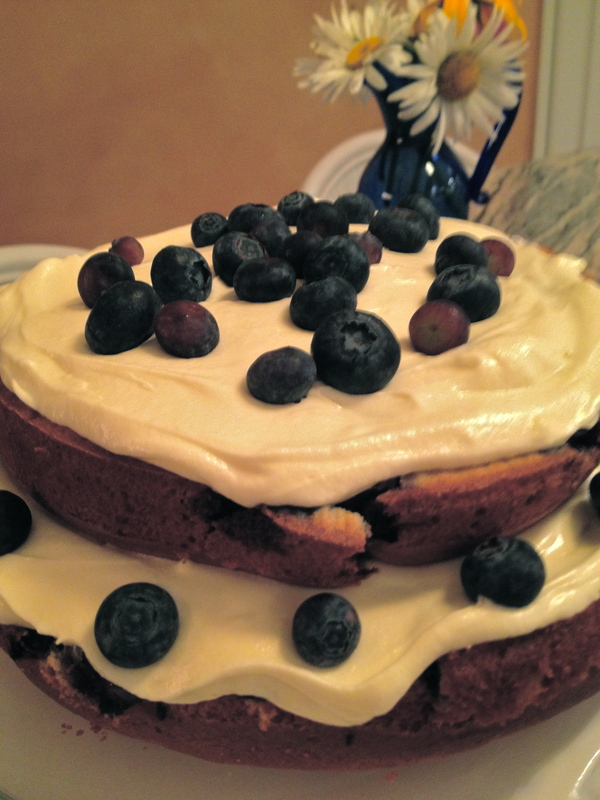 Thank you for sharing the blueberry recipe too.